Felicia stared at the skeleton during the class presentation. This was the first time that they had a skeleton in class. She hardly listened to what her teacher said. The skeleton seemed to be beckoning to her. Her best friend, Leena, turned to her. “What is there to be scared? It is just plastic.” said Leena. It seemed so real to Felicia. When she walked home, she peeped inside her classroom at the skeleton. She felt a twinkle in the sockets and the skeleton seemed to tilt towards her. Felicia was dumbstruck and overwhelmed. She would not be scared from now on. She would look at her great grandfather with reverence. That was a nice surprise, and certainly a very different ‘take’ on the image…! What a twist – you tend to do that in the last few lines. Love it! What a great way to calm a child’s fears. very nice..a clever & delicate idea. Thank you, Zahret, for the kind comment. Always appreciate your stopping by. This is such a wonderful idea – a great turnaround from fear to pride. Thank you, Pirate. It is a rather lengthy story, I suppose:) I’ll look into the challenge for sure. Haha, brilliant idea! 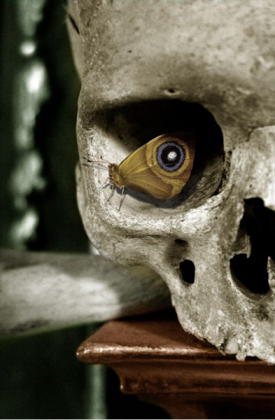 Another great interpretation of the moth: the twinkle in great granddad’s eye. you added warmth to the story! loved it!